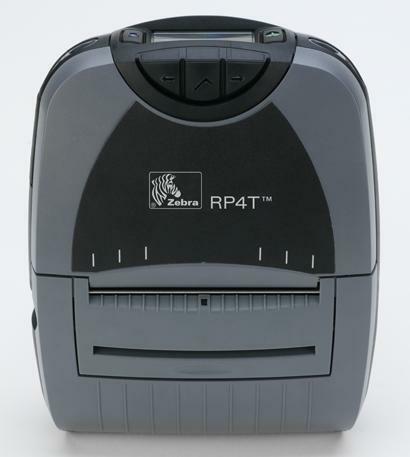 Zebra brings you the world’s first mobile thermal transfer printer with RFID printing/encoding capability. With the RP4T Passive RFID printer, you can print lasting bar code labels, UHF smart labels, and documents up to 4" wide. With the latest Bluetooth 2.0 or 802.11b/g wireless connectivity, battery monitoring, large LCD, center-loading media and large memory, the RP4T boasts an array of features that easily handle your printing needs while being intuitive and user-friendly. Don’t let the sleek appearance fool you: the advanced, ergonomic design stands up to the most demanding work environments. The RP4T serves many industries, including government, manufacturing, transportation, logistics, mobile workforce and field service. RP4T DT/TT 4" 2" - 4.12" 203 1.5 IPS 2.6" 1.375"